Simple and elegant, minimalist nail art designs are easy for beginning artists to replicate and a client favorite. Minimalist designs generally involve executing basic lines, dots, and curves. Simple and elegant, minimalist nail art designs are easy for beginning artists to replicate and a client favorite. Minimalist designs generally involve executing basic lines, dots, and curves, and tend to focus on maintaining balance, symmetry, and order with only a very few design elements. Repetition is also a major aspect of this style of art, as well as neutral colors. Technically speaking, minimalist nail art requires fewer tools than other styles; you’ll only need a basic set of striper brushes and dotters in various sizes. Minimalism is also a style that many nail technicians can learn with just a few hours of hands-on training or practice. Best of all, these designs take little time to execute and can be marked up incrementally per nail — anywhere from $3-$5. 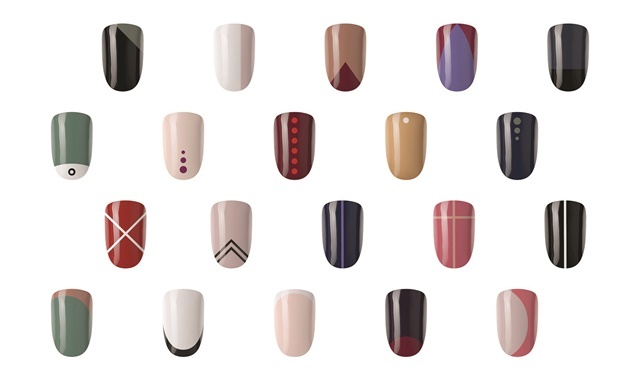 Basic Concepts: When adding minimalist nail art to your service menu, it’s best to have four core concepts and five variations of each concept for clients to choose from — any more than 20 total will overwhelm your clients. Shapes: The hallmark of minimalist nail art is basic geometry. Clean-cut squares, circles, and lines are almost always used in minimalist art. What you will not see are large sweeping patterns or intensely detailed icons or pictorials. Rule of Thirds: When composing minimalist nail art, it’s important to consider the “rule of thirds” as a framework for creating a design that’ll grab a viewer’s attention. Artists throughout history have demonstrated that off-center elements create more tension, energy, and interest than centered elements. In the chart above, most of the contrasting elements are near an edge — very few land dead center. Color: When putting your nail art concepts on display, choose colors wisely. Just because a specific color is popular for a gel manicure doesn’t mean it’ll work for minimalist nail art. Well-designed nail art needs to play by specific color rules. Artists should consider whether concepts should incorporate monochromatic, analogous, or chromatic colors. 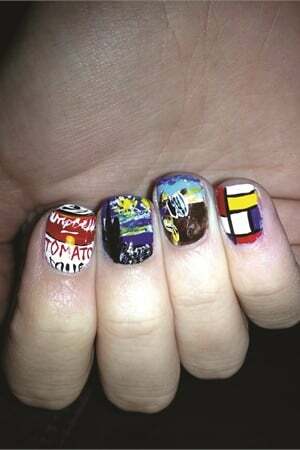 Many different schools of art — abstract, surrealism, and pop art among them — can serve as inspiration for stellar nail art. Joseph Orr is the CEO and co-founder of maniorpedi.com, New York’s Mobile Nail Salon. He works directly with customers who book on-demand appointments in their homes, and also with Fortune 500 clients who want to set up weekly and bi-weekly corporate office visits. You can follow Joseph on Instagram or Twitter @maniorpedi.